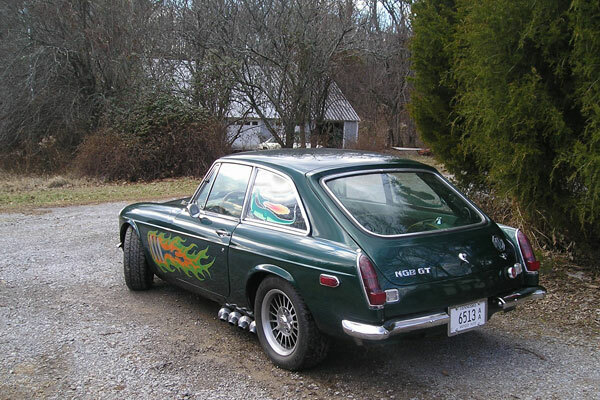 My version of an MGB GT V-8 started when a friend who was a NASCAR builder and driver offered me a 215 Olds V-8 that he'd just hopped up and put in an Isuzu pickup truck as a street rod. He shortly pulled it out, claiming it was too small. He offered it to me at a very low price but I had not thought about putting a V-8 in anything, so I declined the offer. The truck ran well but my motorcycle racing background told me that it was stopped up on the intake and the exhaust. A week later my son told me that the local Jaguar and Ferrari dealer was cleaning out their loft and had some good deals. I attended and purchased several Jaguar parts I had been wanting. I saw four Weber carburetors that came off of a Ferrari 308 and I knew their value so I didn't make an offer even though I knew an Olds engine in bad need of them. The dealer's staff noticed me looking at the carburetors and made me an offer I couldn't refuse. I raced back to my friend's house and bought the Oldsmobile engine. Thus started my V-8 conversion. 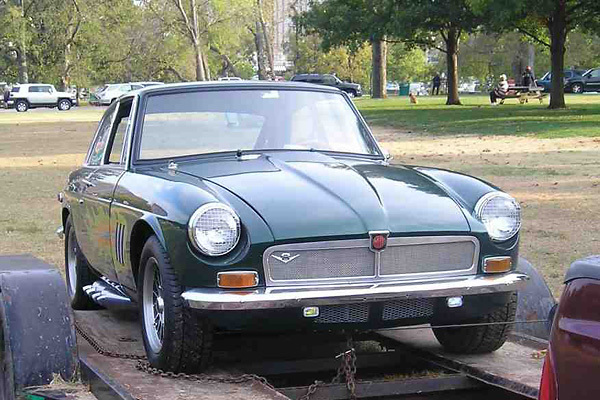 My son had used the MGB GT as an autocross car and for transportation. He wore it out and traded it to me for a Yamaha RD400 motorcycle. 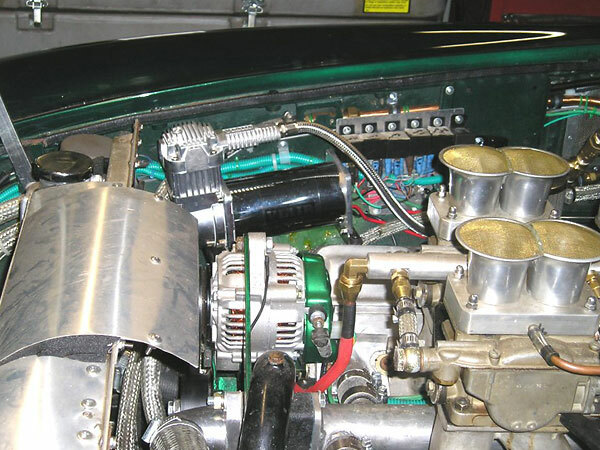 I did a ring and valve job on the MG and then drove it to and from work for 5 years. It was completely worn out and looking rough after that. Floorboards and rockers were rusted-out. Its new black hood was unpainted and its fiberglass front fenders were unpainted. Its dashboard was cut-up. It had no carpeting, one tan seat, and one black seat. The only thing it had going for it was a good set of Mag wheels and wide tires. I didn't think it was worth restoring, but I loved the car and couldn't even think about junking it. Now it suddenly had a new purpose. It would be the basis of a a V-8 conversion! That was over 10 years ago. As I started building, it became my hobby and I started doing things I'd always wanted to do since my days working in Jaguar and MG dealerships. I built a rotisserie and started correcting body damage, replacing floorpans, etc. By the time I finished with the rotisserie, I had acquired four more 215 V-8 engines. One of the Olds engines was not rebuildable so I stripped it down and used it for trial installations while making motor mounts, etc. I didn't like the way other MGB V-8 engine installations often extend over the steering rack, so I cut the firewall away and moved the engine rearward and down. This gave me more room for the Weber carburetors too. I designed my own intake manifolds and sandcast them. To reflect my motorcycle racing days, I wanted to install eight reverse-cone megaphones. My NASCAR friend advised me that was "old school". He said I could use "step headers" to make the same power. I told him my engine would put out all the power I could use anyhow, and the tone of the megaphones is the exact sound I wanted. I replaced the MG transmission with a Triumph TR-7 5-speed gearbox and a TR-8 clutch disk with a Mazda RX-7 Turbo pressure plate. I cut the Olds flywheel down to lighten it and had the pressure plate and flywheel balanced. Then I machined a Honda Civic front pulley to fit the crank and attached a trigger wheel to the back of it for the direct ignition system. After eliminating the distributor, I made a short shaft to drive the oil pump. The oil pan and oil pick-up needed to be shortened to make ground clearance for the oil pan. I modified the oil pump to facilitate using a remote oil filter. I removed the starter ring gear and starter motor and designed and built a distributor to direct inject compressed air into each combustion chamber. Rather then going into the head, I drilled through the cylinder walls just over the top piston ring. On some cylinders my holes broke into the coolant jacket so it was necessary to press in steel tubes to seal the compressed air circuit. I milled water pump mounting features off of the timing cover so I could mount the air distributor there instead. Then I fabricated a custom engage/disengage unit to connect the distributor to the camshaft. A cable control allows me to disengage the air distributor when the engine is running. However, it's necessary to re-engage the distributor just before shutting the engine down to resynchronize the distributor with the camshaft. If I forget to re-engage the distributor before shutdown, I can manually reset the timing with a knob mounted under hood. I needed a one way valve to prevent combustion pressure from blowing back into the pneumatic starting system. I couldn't find a suitable valve so I designed my own; but it took five attempts to build one that would work. However the air distributor itself - the most complicated part on the car - worked right the first time! No modification needed at all. 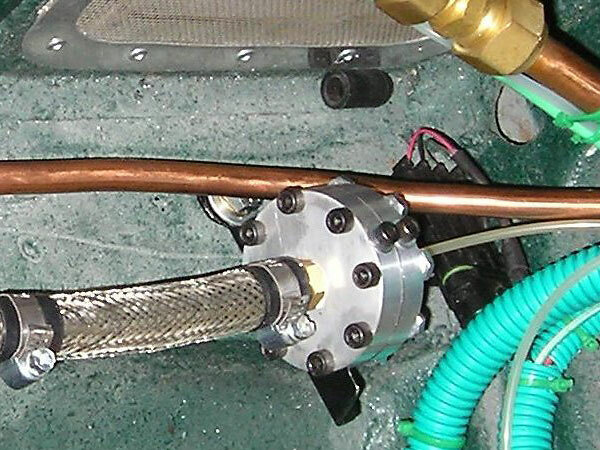 The pneumatic starter system uses an onboard tank made from a Freon bottle. An electrically operated air compressor recharges the air tank. In lieu of a stock water pump, I installed a BMW water pump remotely. 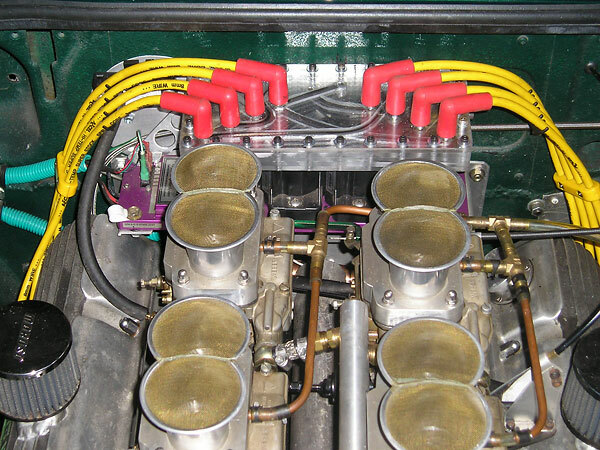 Coolant is plumbed all the way around the engine to fourteen ports in the engine block and cylinder heads. 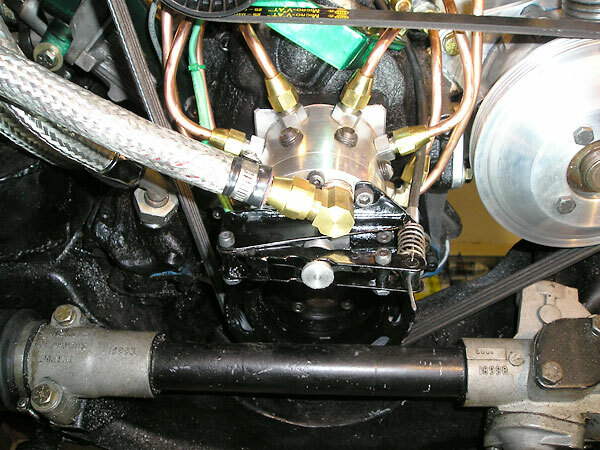 All four outlet ports on the cylinder heads are utilized. (GM's system only used the two front ports.) I blocked off the large transfer ports from block to heads and enlarged the so-called steam holes and made a few new holes between the block and heads. I fear that the engine will be too cool now, so I installed a Jaguar thermostat housing. I can control engine temperatures better with it. I also made a larger then normal water pump pulley to slow down the coolant. My Weber carbs didn't come to me with velocity stacks, so I used motorcycle trumpets. Even with the engine lowered, the stacks came too close to the hood, so I cut from the front all the way back to the rear cross bracing. I lifted the rear of this center section. I installed a sort of cowl induction vent at the rear of this reverse hood scoop. Because I cut the firewall back, I had to mount the accelerator pedal further back. I'm tall, so that made my right knee interfere with the shift lever. I had to make an offset lever to provide room for my knee. The clutch and brake pedals are moved to the left as is the steering column. This also required that I cut the MG steering rack shaft short and add two Moroso steering U-joints. I'd helped a friend who owned a bodyshop with his hot rod, and he offered to paint my GT in return. When I took the body to my friend, I looked through a book of color chips and picked a nice one. It was a metallic green used by Ford on pickup trucks. My friend shortly phoned me to say he was going to report me to the Bondo police. He had to remove the Bondo I'd smoothed on the car. He also said he wasn't going to paint my car the color I'd picked and I should come down and see his preferred color. I tried to explain it was my car, but he didn't want to hear it. Turns out, his color was much better! It's basically a pearl version of the color I'd initially chosen. Then I told him about the flames I was going to paint on the sides after he finished. He said I should let him do the flames too. 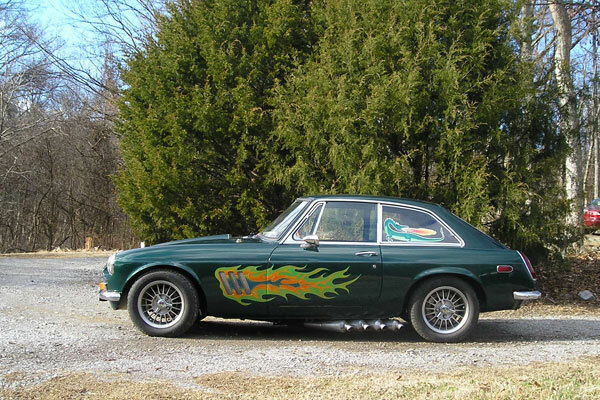 I'd been wanting flames on the front fenders and had looked at flame designs for a long time. I drew some up on my PC and made a transparency to go on a projector. When he finished painting my car green, I took the projector and showed the flames I'd drawn. He said to just leave the projector and he'd match it exactly. The next problem was that the "show car" class paint job looked too good. Now I had to re-chrome my trim to match. I had to start polishing all sorts of parts and I even bought powder coat equipment to make ugly parts pretty. Front hinged bonnet, fender vents, and flames! The car wasn't quite finished last year in time for our local British Car show, but I decided to show it anyway. I hauled it to the show on a trailer. 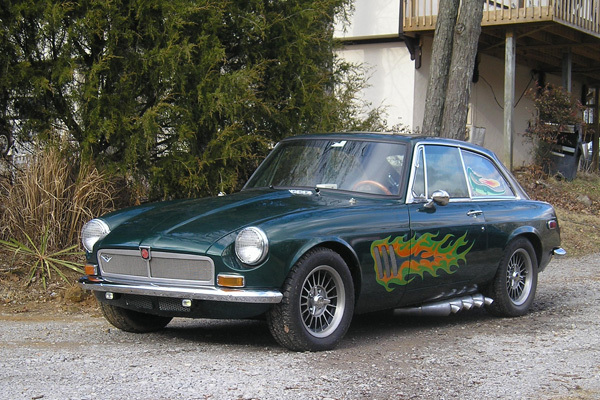 There was no class for Frankenstein cars, so they put me in the same class as regular MGB's. I got a 3rd place award, which I was very pleased with because there were many pristine MGB's there from several states. I even fired it up at the show, which set off car alarms in a 10-mile radius. Ha! I still had running issues which I have been working on this year. It had so many that they were covering each other up. As I found each problem and corrected them, there was still a problem. For example, fuel supply: I had added racecar style safety foam through an access panel cut into the top of my fuel tank. I learned that the foam is so dense that fuel doesn't come out of it very fast, causing fuel starvation problems. Meanwhile, the fuel pump I was using couldn't pump the pressure required by the Weber carburetors. A Ferrari 308 puts out pretty good power for a 3 liter. I figured that my 3.5L engine would need similar jetting. The engine would only run on choke and as soon as the choke was "off" it cut off instantly. Weber jets are expensive so I went to the bank to get a loan to buy several sets of eight each. The bank said they never make loans that large, so the normal procedure of starting too rich and working my way toward lean was out. I purchased one set of jets and started drilling one bit size at a time until my engine would run off choke. One size more and I would have needed to drill out the passageways in the carburetors. Now, the engine would run at high RPM but not idle, so I started drilling out the idle jets too and got it to idle. But now if I revved the engine a couple of times it would die. Double checked the float levels and vents and finally looked at the float needle and seats and found that the needle seat hole was smaller then the size of the original main jets. I then drilled out the seats and re-seated the needles and checked to see that the fuel pressure didn't force the floats down. I drove the car around the yard a little but still noted a fuel pressure drop when revving the engine so I may need a different pump or two pumps. 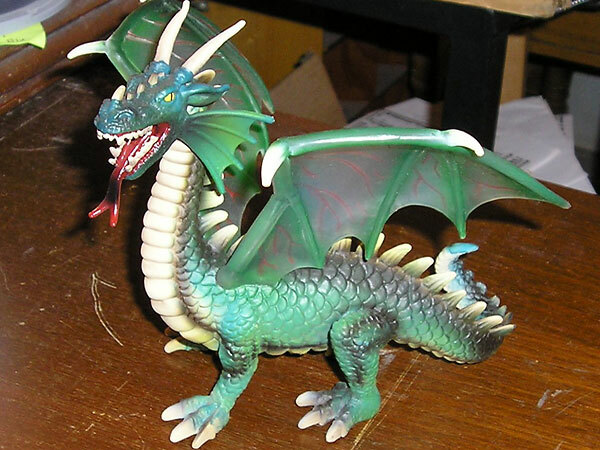 I've decided to name my car the "Green Dragon" but not for the reason one might think. I named it after the Green Dragon Tavern in Boston, MA. This is the tavern where the first plan was formulated to make a new country and rebel against the Crown. Most of these people were British and loved their home country, but they didn't like the way the Crown was treating them in this new land. I love British cars and bikes, but I wanted to make my car the way I wanted it. So I too rebelled. I put in an American V-8. 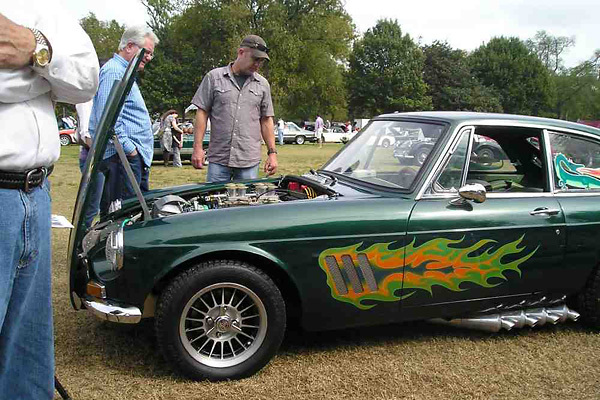 I used many other brand car parts and even committed the sin of putting flames on a British car. My car is a Rebel of sorts and that's is why I have named it after the tavern where American colonists first rebelled against the Crown. I'm proud to fly both an American and British flag on my car. Some purists sneer, but it's as I want it. Engine: Oldsmobile 215cid V8. Honda Civic front pulley, with trigger wheel for crank position sensor added. Offenhauser finned aluminum valve covers. Custom sand-cast intake manifolds. 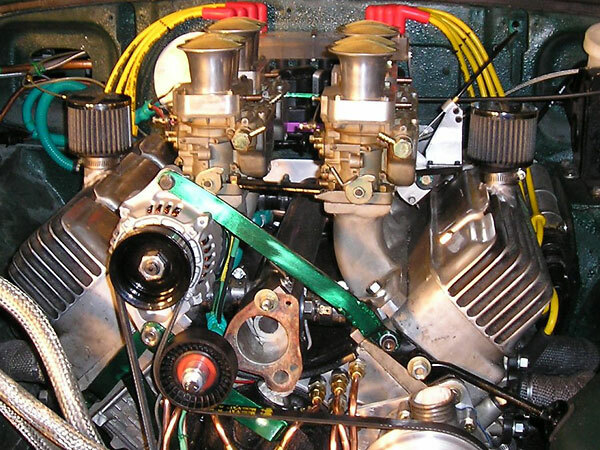 Four Weber DCNF 40mm carburetors. Electromotive XDI ignition system. Accel Super Stock 8mm spark plug wires. Custom shaft installed, to drive the oil pump. Remotely mounted oil filter. 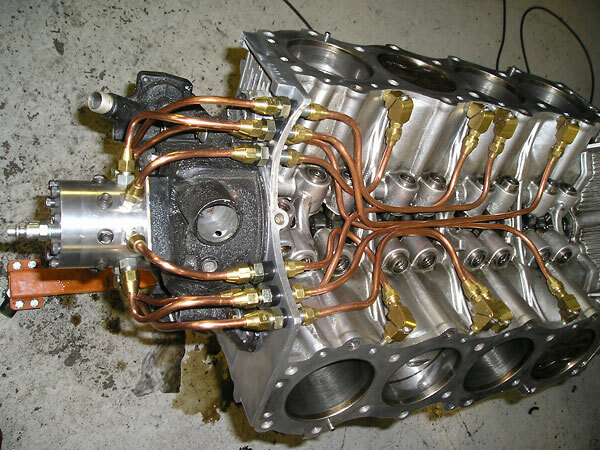 Custom pneumatic direct-injection starter system. Cooling: Summit Racing aluminum radiator (Sum-380324), modified ports. Belt-driven BMW "7 series" water pump, mounted to a piece of aluminum plate. Jaguar electric fan, pushing. MGB oil cooler. Exhaust: eight individual pipes into eight reverse-cone megaphone mufflers. 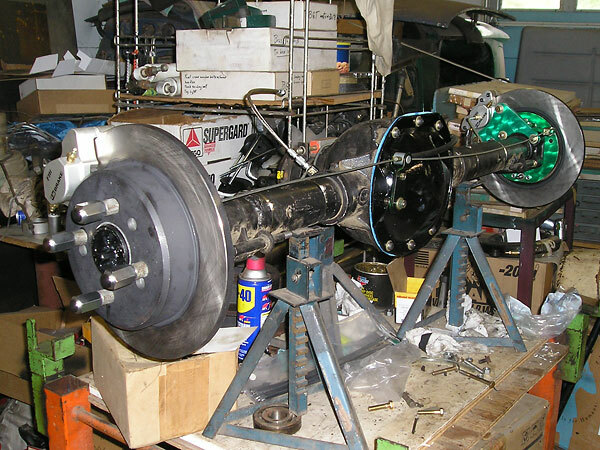 Transmission: LT77 5-speed (from a Triumph TR-7). Triumph TR-8 clutch disk. Mazda RX-7 Turbo pressure plate. Olds flywheel, lightened. Pressure plate and flywheel balanced. Rear Axle: Ford 8.8 housing center section mated to MGB (Salisbury) tubes. Traction-Lok limited slip differential. 3.03:1 gears. Ford axle shafts, resplined by Moser Engineering. Front Susp. : stock MGB shock absorbers. Polyurethane bushes. Oversized rebound stops. 3/4" anti-sway bar on polyurethane bushings. Moroso steering universal joints (2). Rear Susp. : Leaf springs. Tube shocks (Nissan pickup). Polyurethane bushes. Torque arm and coilover shock to stop wheel hop. Brakes: (master) stock tandem master cylinder. (front) Wilwood four piston calipers. Toyota van vented rotors. (rear) U.S. Brake calipers. Ford Crown Victoria rotors. Wheels/Tires: vintage magnesium wheels (marked "England"). 14" Remington tires. Electrical: Nippondenso alternator. Single 12 Volt battery. 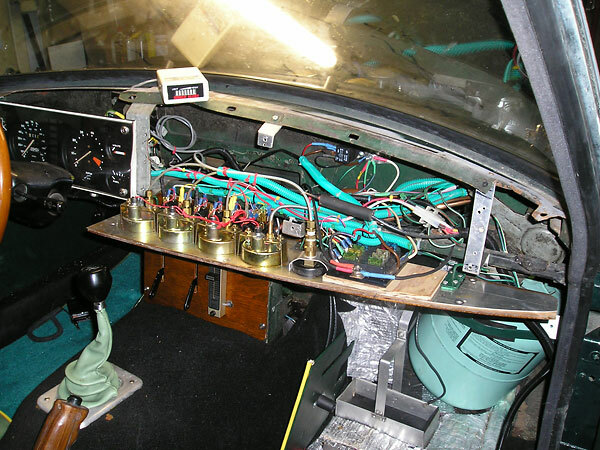 Instruments: Triumph TR-7 instrument cluster plus five additional gauges. (i.e. manifold vacuum, fuel pressure, oil pressure, oil temperature, and pressure in the air starter tank.) MSD knock sensor (LED) display. 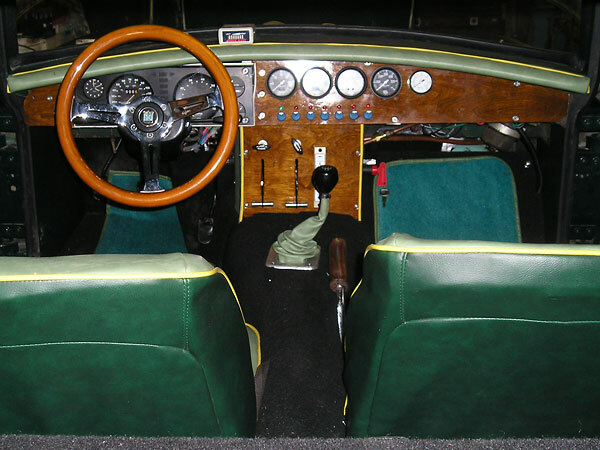 Interior: custom wood veneer dashboard. 13.5" steering wheel. Triumph TR-7 seats with headrests removed. Custom upholstery and carpet throughout. Body: custom aluminum and stainless steel mesh grille. Bumper overriders removed. Fiberglass front fenders. Front fender vents (behind the wheels.) Custom front and rear fender flares. Front-hinged bonnet with cowl-induction scoop. LED license plate lamps. Custom badges. 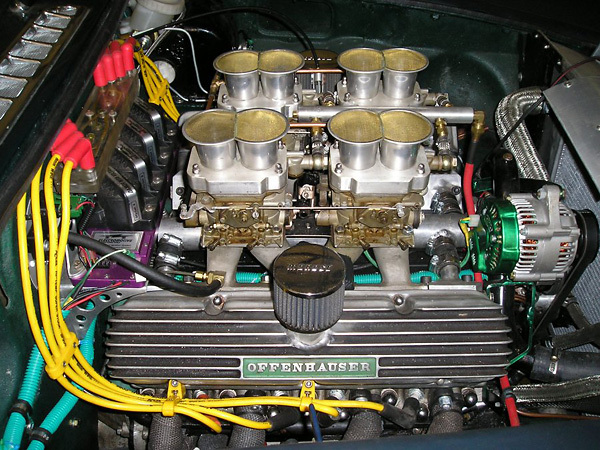 Oldsmobile 215cid V8 with four Weber DCNF 40mm carburetors and Offenhauser valve covers. about 10 degrees After Top Dead Center and closing at about 110 ATDC." Center: air distributor for the pneumatic starting system is cable actuated. driven through a oversized hand-made aluminum pulley. Electric air compressor. Nippondenso alternator. 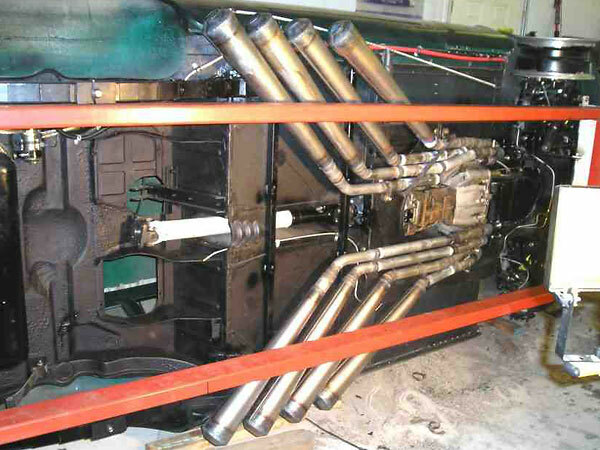 Eight individual pipes into eight reverse-cone megaphone mufflers. Car' system of a torque arm and a coil over shock to cut down on wheel hop." fuel pressure, oil pressure, oil temperature, and pressure in the air starter tank. 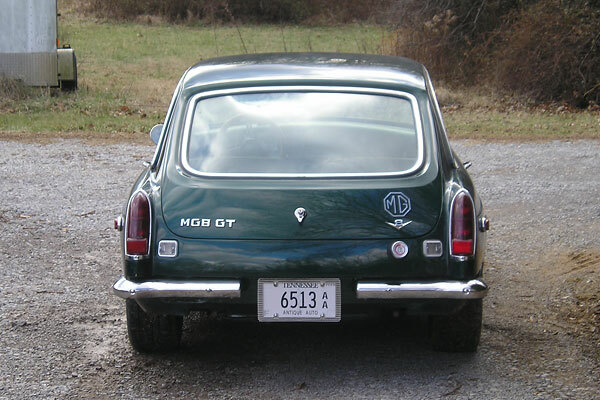 TR-7 seats keep you in the seat when driving hard and the MG seats don't." tank in the passenger-side footwell stores air for starting the engine. but the specific manufacturer is unknown. Custom aluminum and stainless steel mesh grille. Modified hood with raised center. Tasteful fender flares. Four muffler tips per side. and they haven't been available in the aftermarket for many, many years. All photos by Howard Fitzcharles for BritishV8's exclusive use. Copyright 2014. All rights reserved.